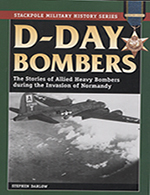 Before Allied soldiers set foot on the beaches of Nomandy on DDay, June 6, 1944, American and British bombers helped pave the way by pounding German positions on the shoreline and farther inland, a vital mission that continued as the troops waded ashore and the battle beyond the beachhead began. In this lively look at DDay in the air, eight different bomber crews, three Americans and five British, tell their unforgettable stories from inside B17s, B24s, Lancasters, and Halifaxes. 288pgs, SB B &W photos, 6 x 9in.